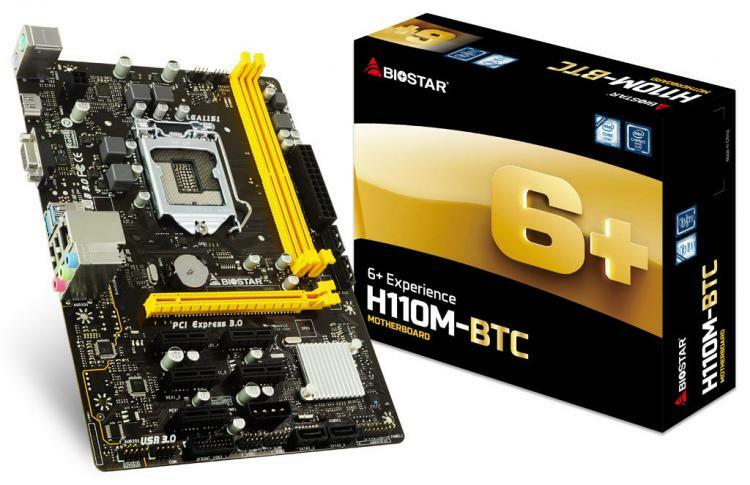 BIOSTAR expands its mining-oriented motherboards with the new H110M-BTC with a smaller micro-ATX form factor and Intel H110 chipset dedicated for crypto mining systems. Even in a smaller form factor the BIOSTAR H110M-BTC sports 6 x PCI-E native support for mining GPUs. The H110M-BTC also supports all the essentials in optimizing your mining rig which includes the 7th generation Intel Core processors, dual channel DDR4 memory support of up 32GB, HDMI port and speedy USB 3.0 ports. The BIOSTAR H110M-BTC is optimized for mining and removes other unnecessary features to keep costs down. The native support for up to 6 X PCI-E with a 4-pin 12V AUX power connector enables 6-GPU mining setups with improved power support. The 100% solid capacitors makes the board extremely durable and suitable for mining operations. The monitor output supports HDMI KVM for easy management of multi-mining setups or D-Sub KVM for more conventional multi-monitor setups. - PCI-E Gen 3.0 slots enabling up to 8GT/s bit rate. - USB 3.0 connectivity for peripherals without losing a step at transfers of 5 Gbps. - Moisture-proof PCB and Low RdsOn P-Pak MOS for improved durability. The BIOSTAR H110M-BTC is ideal for compact mining rigs offering 6 x PCI-E native support and strong features for crypto mining. For more information, visit the product page at the BIOSTAR website.